Rocky Mountain National Park. Established on January 26, 1915, Rocky Mountain National Park is a living showcase of the grandeur of the Rocky Mountains. 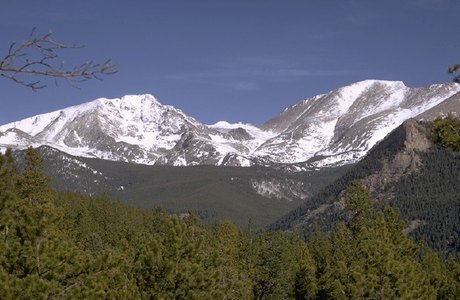 With elevations ranging from 8,000 feet in the wet, grassy valleys to 14,259 feet at the weather-ravaged top of Long's Peak, a visitor to the park has opportunities for countless breathtaking experiences and adventures. Elk, mule deer, moose, bighorn sheep, black bears, coyotes, cougars, eagles, hawks and scores of smaller animals delight wildlife-watchers of all ages. Wildflower-lovers are never disappointed in June and July when the meadows and hillsides are splashed with botanical color. Autumn visitors can relax among the golden aspens or enjoy the rowdier antics of the elk rut (mating season). 359 miles of trail offer endless opportunities to hikers, backpackers and horseback riders. Fly fishers, bird-watchers and photographers discover the splendor that they traveled so far to find. During the winter, snowshoers and cross-country skiers revel in the white-blanketed tranquility of meadows and forests. 60 peaks rising above 12,000 feet challenge intrepid hikers and climbers. Anyone visiting between Memorial Day and late autumn can see many of these peaks eye-to-eye by driving over Trail Ridge Road. Topping out at 12,183 feet, this is the highest, continuous, paved road in the United States. Front-country and backcountry campers have hundreds of campsites to choose from. Civilization and its amenities are available in the towns of Estes Park and Grand Lake which flank the park on the east and west sides respectively. Ranger-led activities are an entertaining way to learn more about your surroundings. Plan some time to acclimate to the high altitude and come find your adventure in Rocky Mountain National Park.